← Whither A Transcontinental Railroad? When I first joined Women Writing the West in 2011, the name of Alice Trego seemed to be everywhere. Not only had Alice served as the group’s President, but she had also held positions as Treasurer, Newsletter Editor, Catalog Editor and VP Conference. In addition to giving her time in these demanding posts, Alice had also spearheaded the group’s LAURA awards—their short story competition for members—and had help edit and redesign the WWW website. Alice’s own writing career started in the late 1980s, writing for a column called “Conversations” in Missouri’s Suburban Journal newspapers. By the 1990s, she had expanded her portfolio to include historical non-fiction and fiction, garnering notice in several competitions. Although a journalist by profession, Alice’s main area of interest is early 1800s western history. She now writes Native American and other historical fiction stories, often losing herself in her research. Alice says that unknown facets of history let themselves be known to her, and she has to investigate them further and determine if they will have their own place in her stories. Currently she is researching a well-known Montana family for a book-length creative non-fiction project. She remains a member of WWW as well as Western Writers of America. I’m delighted to have Alice Trego here as my guest. There have been numerous variations of this quote since Mizner made the remark while working in early 1900s Hollywood. However, versions of his remark in the decades before and after seem to allude to the same premise – research entails a lot of legwork, scrutiny and investigation so that authenticity is key in stories. As a journalist, I learned early in my writing career that seeking more than two resources is a must. As a writer, I adhere to Mizner’s “philosophy” so that both my historical non-fiction and fiction have depth of history . Consequently, I have a tendency to become lost researching history for my manuscripts. I become so engrossed in finding the nuggets of history that I forget I have to write, too. I’ve also discovered that sometimes trickles of information appear before me in the strangest scenarios. For instance, on one occasion I ordered a book from a museum gift store because I knew the material would be exemplary. This hardcover contained beautiful photos of busts and statues by a well-known western bronze sculptor, Bob Scriver. When I opened the book, I turned directly to a picture of a bust of a famous female Indian warrior. A couple of days later, I received a publication from a different museum where I have a membership, and a story featuring the same female warrior caught my eye. The article mentioned a book written about her in the early 1900s and I knew I had to search for that book and read her story. I did some research and the path led me to the Special Collections department of the J. Willard Marriott Library at the University of Utah. Needless to say, this woman has intrigued me for many years since that hardcover showed up in my mailbox. Someday I will write her story. Magazines – Because I have many museum memberships, I have the privilege of receiving their publications via snail mail. Some will yield information for my stories, some will not. All the same, I save these magazines because the information contained within their slick covers is invaluable to me and I never know when a bit of history will pop up. Books – As a writer, I have a fondness for books. 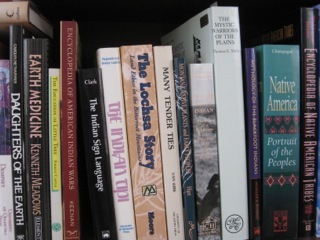 My bookshelves hold an array of books, arranged alphabetically, that I have collected through the years and are mostly about the subjects I’m passionate about– Native Americans especially. I covet my Time/Life Books titled “The Old West” wherein every detail that a historical writer wants/needs to know about the Old West is included in these wonderful books. Montana Historical Society – www.montanahistoricalsociety.org – Since I feel a kinship to the history of Montana, I joined the historical society there so I’d be able to keep abreast of all information received either by snail mail or e-mail. Now that most historical societies are preparing their archives for digital research, preliminary searches can be done online before a possible on-site visit to dig through the society’s many collections. The Northwest Montana Historical Society (Museum at Central School) – www.yourmuseum.org – When I had the opportunity to visit Kalispell, MT to do some research, a friend of mine introduced me to staff members at the Museum at Central School. I gave them a little information about my subject, and they were able to pull folders from their attic archives.I joined the society for two years, and a benefit of that membership allowed a certain amount of research with the knowledgeable staff, one on one, as well as having a set amount of copies made for me. I came home with an abundance of information. Buffalo Bill Historical Center – www.bbhc.org – I’ve belonged to this icon in Cody, WY for many years. Even though I have yet to discover a special nugget of research there, their publication, Points West, is an invaluable resource for me. National Museum of the American Indian – www.nmai.si.edu – Because I have an affinity for Native American history, I joined NMAI in Washington, DC,. Their slick publication yields some highly informative articles about different Native American cultures. In addition, my membership dues help maintain the museum and its many exhibits. I am fortunate to have many resources available to me for my historical researches. I’d like to think that perhaps Mizner wasn’t fully aware that this writer of historical stories who tends to become lost in research would take his “prophetic” words to heart. *********************************************************************** Alice can be found on LinkedIn — www.linkedin.com/pub/alice-d-trego/1b/3b5/8b3/ — as well as on Facebook https://www.facebook.com/alice.trego Her website, www.alicetrego.com is under construction. This entry was posted in 19th C., History of the West, Literature of the West, Women writers, Writing and Literature and tagged Alice Trego, Buffalo Bill Historical Center, historical research, J. Willard Marriott Library, Montana Historical Society, National Museum of the American Indian, Time/Life Books, Wilson Mizner, Women Writing the West. Bookmark the permalink. Thanks so much for joining me here this month, Alice. Much appreciated! This is a helpful post and I’ll look into resources I haven’t used…and get lost! Thank you both. Yes, wasn’t it helpful, Arletta. I’m certainly signing up for one or two of the museums Alice mentions. Thanks for stopping by. Ooooh, I have a dozen or so of the Time-Life Old West series, as well- and I had them for decades before I ever thought to use them in writing my own books. I think that the aspect of most value to me are the illustrations – because they help me to build the detailed visual setting that my characters move in. Same goes for all the issues of American Heritage that I have – it’s often the contemporary-to-the-period photos, prints and paintings which help the most! Interesting that you have the Time/Life books. When Alice sent me the blog post, the first thing I said was “we used to have those!” I remember my parents receiving them all the time but I don’t know what happened to them, sadly. I’m very intrigued that you say you use the illustrations as a springboard for settings. Fascinating how one’s imagination works. How wonderful that you have the Time-Life Old West series, Celia! I found most of my books in many used book stores. I’m also a fan of the illustrations, and I agree — they are a tremendous help when describing the setting in my stories and they certainly help stir the imagination. Hey Alice! So great to see you still in the game and researching. Thanks for sharing these resources. Great post, Andrea. Thanks for sharing Alice. And thank you for coming by! Belated birthday wishes, Eunie! Many happy returns of the day. Thanks, Eunie, for your support. I remember our conversations, too, about the Montana family as well as Montana, and I still have the notes! I have more research to do, but I’ll hurry just for you. Hope you had a great birthday! Thank you, Alice, for sharing your wealth of information with us. I’ve known Alice for many years through Women Writing the West. I can vouch for her vast knowledge and willing help with many projects. What a gal! Thanks for those kind words, Mary. I’m very privileged she agreed to do this post for me. Mary, you are too kind. I always enjoy sharing pieces of information with my author/writer friends, and I’m glad Andi let me share them here on her blog. I had no idea that museum memberships allowed special research opportunities. Alice – your knowledge never fails to amaze me. Thanks a bunch for sharing. You’re welcome, Karen. I discovered this facet of research many years ago when I began gathering material for my Montana family story. I belonged to the historical society at the time and I knew that, from joining, one of the benefits was a specified time for individualized research. I requested some information from them and about two weeks later, copies of their research were sent to my snail mailbox. Most museums/historical centers limit those kind of researches to two per year, and the number of copies from their research is limited, as well. It’s fun and interesting to see what kinds of historical tidbits they find for you. Buffalo herd? I didn’t know about that…. Glad this was useful to you, Heidi. I’m so glad you found these resources helpful, Heidi. By the way, I just learned today when I received my electronic newsletter from the Buffalo Bill Historical Center, there is a notation that they are now known as Buffalo Bill Center of the West. Another benefit of belonging to historical centers and getting their e-newsletters is that information, and knowledge, is immediate. Hi, Alice. Great blog. Glad to see you’re still in there kicking. My backlist is being released as ebooks now. I have a great publisher. If your book is ready and you’re interested in e-publishing I’d be proud to recommend you to my publisher. Good “seeing” you again. Hi, Charlene! Thanks for stopping by Andi’s blog and good to “see” you here, too 🙂 Wonderful to hear that e-books of your backlist are in the offing. Your stories were great reads and it’s good to know that they will continue to have more readers in the future via electronic publishing. And thank you for your kind offer — will keep you in mind. Thanks for the tip on putting that National Museum of the American Indian to use. My favorite form of research is ‘Doing the landscaping’ for a book. Riding a horse through the Paha Sapa you can find the sacred center of the Lakota nation in those black hills. Further south you can ride the hills near Lincoln New Mexico and put your finger in the bullet hole Billy the Kid left in the county jail. It doesn’t get any better than that…. I’m with you on this one, Paul, though it has to be said that we still can’t do without the books, museums and libraries etc. Otherwise, how would we know what that bullet hole was and the history behind it? I also tend to get lost in research. Fortunately, I write numerous books in one locale and time period, so the initial research is the most time-consuming. Thanks for sharing. Using one locale and time period would certainly save some time! Thanks for stopping by Caroline. Caroline, it’s nice to hear that someone else gets lost in research 🙂 Even though your stories are set in the same time period, I bet you find new nuggets of historical information each time you begin your initial research? Thanks for coming by Andrea’s blog — it’s nice to “see” you here. Andi, this is the closest you have I have been to being in the same place this year! I hope we meet one of these days. Beautiful blog (and great earrings in your photo). Alice, I enjoyed your post and your great research suggestions. I’m there with you and Caroline getting lost in research. I remember almost 20 years ago becoming so fascinated by some old Indian Agent documents in the National Archives that I copied the whole file. Only later did I realize those documents did not pertain to the person I was writing about. After all this time, I’m working on a biography of the person central to the documents. I can certainly relate, Cynthia. There have been many times where I have collected an abundance of information for one story and not use any of it. But I know if I hold onto those important details I uncovered, then I’ll be able to use them for future stories. I like to think that as a researcher of history, there is no such thing as having discovered too much information 🙂 Great that you held onto your research so you could finally incorporate the details into your current WIP. The story sounds intriguing. And thanks for taking the time to add to this discussion! Always late to the party, this is how far behind I’ve fallen during moving. Such a good interview, Andi. I enjoyed getting better acquainted with Rhonda. And congratulations on the Golden Apple. That’s fabulous. Better late than never, Velda! Are you talking about my being a RONE finalist for Best American Historical? Yeah, it is pretty great but the competition is stiff and I now have to go to Vegas in August, a place of which I completely loathe the very thought. All that concrete and neon, never mind a hotel with nearly 3000 rooms! Didn’t know you were moving–good luck and best wishes for the future in your new home then! !